thecookiegal | Welcome to the CookieGal's world! Have a Holly Jolly Christmas? So the song goes, “have a Holly Jolly Christmas, it’s the best time of the year”. Maybe for some….but as I talked about during our 1st Christmas with out Alexander it isn’t always easy to be jolly this time of year. Alexander second and last Christmas was spent in the hospital. He had been there since November 17th, and wouldn’t leave until December 31st. We tried to make it nice. Samta visited. We had a nice Christmas lunch. But, really, how nice is a hospital room on Christmas? Not too nice. I was at a meeting of the Compassionate Friends last week and I was talking about how I was finding it very hard to be HAPPY and see the JOY of Christmas through the eyes of my two girls. Julia especially is very excited this year. She mailed off her first letter to Santa, and was so excited to help decorate the trees. I bought this cute little thing for the tree. It is a Mouse holding a candle – you Blow on the candle and it turns all the lights on and off! She is very happy about it. I was saying to the group, that I think I am AFRAID to enjoy their joy. I am afraid to smile too much. Why? Because, of the what if’s…..what if they get cancer and die too. What if they get in an accident….what if and alien kidnaps them! Okay, maybe not so much about the alien, but you get the point. When you loose a child it changes you forever. Part of your heart is broken in a way that can never be fixed. I could have a dozen more children (YIKES!) and even then, I would still have that missing piece. Nothing can repair that part of my heart. Nothing. This Christmas (and everyone for that matter!) When you are getting stressed about wrapping presents, baking the cookies, and getting all your shopping done, please take a minute to just PAUSE and be thankful for all that you DO have. If it gets too overwhelming, just STOP. You don’t have to bake the cookies, or buy and wrap all the presents. It will all just be okay. Say a little prayer for for those in the hospital, those in the military who are far away from their families. And say an extra special prayer for those of us who are brokenhearted. Nothing too exciting to write about, but I have a few things running around in my head. 1st. Toddler bedtime! Miss J, is an expert at taking her time to get to bed! Drives us crazy some nights. One more book…..I am thirsty….turn the light on, I am afraid of the dark (despite her nightlight) . Tonight was an easy night – because she didn’t take a nap! Ah – the nap – so good for me, so I can get a nap. But, if she takes a long one, that it is harder to get her to bed at night. If she doesn’t take one at all, then she is crazy at night!! The logical part of me knows that she needs to get to sleep at a reasonable hour, because if she doesn’t then she will be cranky pants the next day! I have things I need/want to do at night – and can’t if she is awake. Yup. That is the mind of a cancer mom. We go down that road. Not every night – but often. And on that topic of STUPID cancer….there is often a debate among the cancer world – are those dealing with cancer “fighting” are the on a “journey” did they “win or loose” the battle!?!? For me, I say that Alexander fought a battle with STUPID cancer and lost. Some people might think that is wrong to say he “lost” his battle. To them, “loosing” implies a person didn’t fight hard enough, or well, or something like that. But, I look at it differently. I look at cancer as a BATTLE. It is one that people fight very hard. STUPID cancer is an EVIL beast, and it can’t always be beaten. I liken it to soldiers fighting in a war. War is also an evil beast, and sometimes people die in it. But we don’t look at those people as being a looser. We call them HERO’S! Those that make it home from the war front are also called HERO’S! So for me, any one fighting a battle against STUPID cancer, is a HERO, no matter what the outcome. We have this quote on Alexander’s headstone. He fought a very hard battle, and put up a good (No GREAT) fight. It may have beaten him, but we know now that he is Safe in the arms of God and His Angels. The statue in my City will be at Horn Pond, a beautiful location in town. (http://www.woburnmaps.com/hornpond/) My dad use to love walking this pond! There are some people in our city that are not happy with the location for one reason or another. They have a right to their opinion of course. And, I have a right to mine, which I have written out in a letter to the editor. On April 1, 2011 I joined a club that no one wants to be a part of. That is the club of people whose children have died. 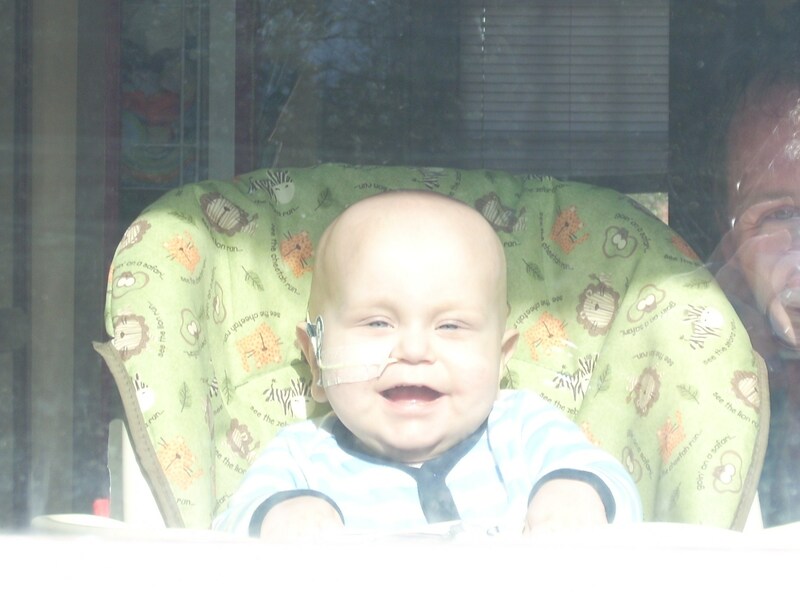 My son fought STUPID cancer for 13 months, and died when he was just 21 months old. Because he was so young, and so sick, he never went to school, playdates or made any friends outside of the hospital. As parents, we want our children to never be forgotten. But, life marches on, and people move on, and forget. Oh sure, they will remember when they see us, but unlike parents, thoughts of our children are not part of their daily lives. Some children are remembered through year book dedications, or scholarships being named after them. But as I said, my son was too young for school, so there will not be any of that. Not long after my son died, I heard about the Angel of Hope that is in Sterling, MA. I thought it was a wonderful idea, but being so far away, I did not have a chance to visit it. I thought about having a paver placed in my sons memory there, but again, it was far away. When I learned that a group was wanting to bring an Angel of Hope to Woburn, I knew that was something I wanted to help happen! I was excited that it would be at Horn Pond, a place that many people go to, to walk, run, and enjoy the beauty of the area. I thought it was a perfect spot. The pond on the other hand is a place of beauty and peace. My late father use to enjoy walks around the pond and just sitting with its beauty. I know that the bereaved parents that have placed a memorial paver in their child’s name, will find peace, knowing that someone will see their child’s name in letters. In one letter to the editor, someone suggested that a cemetery would be a better location for this memorial. I for one, think that would be the worst spot. A cemetery is a place of sadness. Many of us bereaved parents have children buried there, and when we go to visit, it does not bring peace and joy. Rather anger and sadness that our children are even there. It is not right for a parent to have to bury a child. To the family who has a bench in honor of their loved one who died on September 11. I can’t speak for others, but I can assure you that every time I see that bench, I say a little prayer for your loved one, and all those that perished on that horrible day. I imagine that people visiting the angel, will sit in that very bench to think of their children, and I am sure your loved one will come to mind as well. By speaking our children’s names, we remember their lives. We remember what joy they brought to us and the world around us. No, my son won’t have year books dedicated to him, but his name will be forever etched in stone, for the hundreds, if not thousands of people that walk the pond every year to see. I thank the Webster family for bring this memorial to town, and I thank the Mayor and those that approved for it to be in such a special place. What is it about the number 5? When I was in High School, I went on a retreat, and we had teams that had competitions. Our team leaders said to us “hey, this is the 5th year of this retreat, and 5 is special, so let’s win!” We did win. The ONLY year I was ever on a winning team, as a camper or as a staff member! for kids, 5 seems like a cool age to be. Maybe because you can use all your fingers to show your age, or because if your birthday is just right you can start kindergarten? Many birthdays seem to be special in 5’s – 10 (double digits) the Big 30, 40, 50, (okay, so you could say those are 10’s but I am sure you get my point. Today has been 5 years since I last held my beautiful son in my arms. 5 years since my heart was shattered into a million pieces. Some of those pieces have been put back together, but there will always be one missing. 5 years. How the hell did that happen?? So much has happened in 5 years. I buried one child. I gave birth to two more. One of my children had open heart surgery at 6 weeks old. We moved into my childhood home. I started on a new job, far, far away from the nursing field. So many things have happened in just 5 years. It seems like a lifetime ago, but yet it seems like yesterday. As Richard pointed out in his post earlier tonight, I can hardly remember what I did 5 DAYS ago. But I could tell you everything that happened from April 1, 2011. Like him, I won’t go into the details, because they are horrible. For a long time, when I would close my eyes to go to sleep ALL I could see was those horrible moments. That did eventually fade. But, I can recall them in second if I want to, and sadly sometimes, even if I don’t want to, they will pop back into my mind. I woke up early today. When I did, my heart was aching. Literally aching. I looked at the time. It was the same time when Alexander first started to crash and have trouble. A bit later, I really wanted to just stay in bed all day, but we had plans to do something special. Julia wanted to “wake mama up” but Richard was pulling her away. Elizabeth, managed to find her way into the room, and I told Richard it was okay. He called Julia in to “wake mama up” and she did! The two girls climbed into bed and crawled all over me. We had a fun time laughing and talking about what we would do today. The aching started to fade away. We had a pretty good day. Lots of laughing and fun. In one of the support groups I go to we often say, you don’t move ON but you do move FORWARD. That is what I do. one day at a time, sometimes, one moment at a time. I move forward. Further away each day from the worst day of my life. Some days the pain is as raw as it was those first days. But, thankfully more days than not though, it is there, but not right in front of my face. Life is bearable most days. Some days it is great. One day, one moment at a time. I remember going to the hospital garage getting packing up some of our stuff that we had brought to the hospital and finding a book (Noble Dead series) that I had misplace and though lost before going home. I don’t remember the drive. I remember very little of the next week as we prepared for Alexander’s funeral. Time has moved on Nancy and I have two beautiful children Julia, almost four, and Elizabeth, 2 1/2. Where has all of the time gone? I can list off lots of stuff that happened some of the very slowly and some of them very fast. Slow ones my wife being pregnant twice, my 22 hour work day Sunday into Monday mornings. The fast one Elizabeth’s 2-3 hour open heart surgery and then being out of the hospital in one week. I would like to say to all of my friend in the group no one wants to be it. Thank you for all of your support over the last five years. Nancy and I think about your families all the time as your anniversaries of your children passing comes along. To Camp Sunshine Thank you for the Services that you provide to all of the families going through cancer and bereavement of children who have passed. To my family, thanks for your support. To all of my other friends, remember that time is a weird thing. Play, love and enjoy ever minute with you children and family. Because I pray that you never have a day where all of the details are burned in you mind like my day five years ago. But there are still some days, that are very difficult to get through. There are still days I wish I could just crawl under my covers and stay there forever. I wish I didn’t have to deal with life – to work – to take care of my children – to have chores to do. It can be hard to get up, and put a smile on my face and face life. When my kids were newborns, I thought that age was pretty boring! (although some days I do miss just being able to snuggle them and rock them to sleep) It is fun to watch the children grow up and do new things every day. My older daughter is very bright and comes out with the smartest things! It is fun to watch her play pretend and make things up in her head! My younger daughter, is climbing into EVERYTHING right now. Drives us nuts, but we love it too! While I am loving this age they are in, I am not like most people who say “don’t grow up to fast!” or “how did they get to be that old?! ?” I am SO HAPPY they are GROWING UP and getting older. In fact, some days I want them to HURRY UP and get older! Not to make my life easier (no diapers, no sippy cups) but just because they have the CHANCE to grow up! Alexander didn’t have that chance. He didn’t even make it to be 2. Growing older is a GIFT not every one is given. Hug your family and tell them you love them every day. Camp Sunshine November 2015 and other ramblings…. I didn’t know about Camp Sunshine when Alexander was alive. Because he was in the hospital so much, it is likely we wouldn’t have been able to go then anyway. Camp is a very special place. It is a place that kids with cancer and other illnesses, can just be KIDS. They get to run, swim, play, and not worry about other kids looking at them funny, or being afraid of them. During the bereavement weekends, it is a chance for us parents to talk about our children without making anyone feel uncomfortable. If you are not a bereaved parent, you might be thinking “why would someone feel uncomfortable?” Believe me it happens. You mention that you have a child that died, and people just don’t know what to say. Some people change the topic, and some people just won’t mentioned the child that died at all. Sometimes, they will say “I don’t want to make you sad”. Well, let me tell you NOT talking about our children makes us sad!! Yes, we might cry talking about our children, but that is perfectly okay and normal. When we are at camp, we can talk about our kids, cry, laugh, remember. It is a beautiful time. We don’t have to pretend to be happy. A lot of people do that. They go to work, and put on a happy smile, only to cry the whole way home, or at night when they are alone. Camp is a lot of fun for both the parents and the kids. The kids go off to Day Camp, broken down by age. The parents have free time, discussion groups and Super Duper Blooper games! The games are fun and silly, a way to get to know other parents in a fun way. This session however, I decided to skip them. I also skipped out on most of the discussion groups as well. I don’t know why really. Just kind of needed to “be” this session, rather than be involved. We talk about a lot of different things in group, but often the same topics come up from all parents. A big topic is Worry. We worry about our living children – how are they handling the loss of a sibling? Will they get sick too? Will they die too? Someone made a point about saving our living children’s clothing. I too have thought of that. What if something happens to one of my girls, and I need to make a memory quilt for them? I try not to live in those thoughts for long, but they do cross my mind. Camp is a wonderful place, because I have met so many wonderful families. I wish I never had to meet them, but I am really glad I did. Grief is a difficult thing. I am 4.5 years into this journey without Alexander. Sometimes it feels like it was yesterday that he was here, sometimes it seems like a lifetime ago. There are days when I just want to stay in bed all day with my head under the covers, and there are days I can go about my life and be happy. 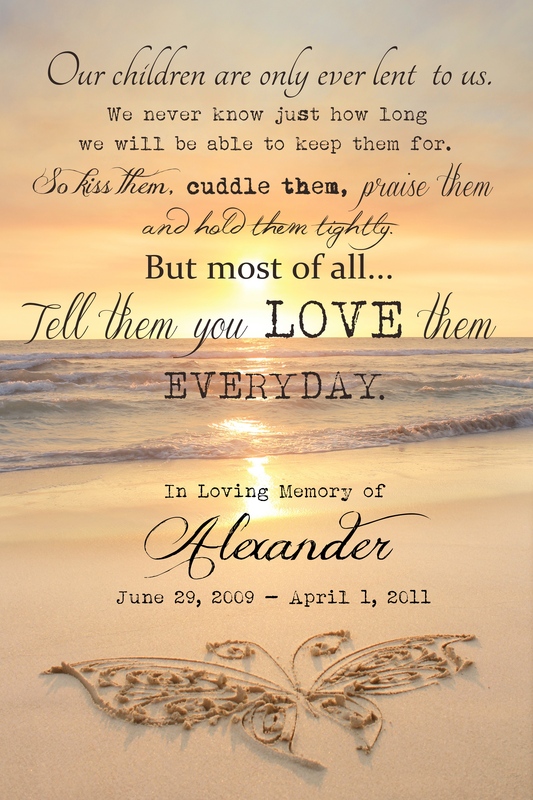 But, even in those happy days and moments, if I stop and think, I remember Alexander and how much I have lost. I often hear people say “our child was born and our family is complete”. My family will never be complete. We will always be missing a part of it – a part that can never be replaced. People that are new to this journey ask “does it get better”? I don’t know if I would say better – because life will never be the same, but it does get different and bearable. Yes, I am happier than I was 4.5 years ago. Yes, I smile more than I cry. (in fact, I was saying to the moms discussion group, that I haven’t really cried about Alexander in a long while, and even that makes me sad!). Some people might say “well, you have your girls now”. Yes, that is true. They are both Joys in our lives. But, even with them, I am sad. Sad that they never knew there brother, sad that they have to visit him at a cemetery. Sad that he never got to be a big brother. I will end this post with a link to another blogger I recently discovered. As you know, Alexander died when he was just 21 months old. He never got to be 2. He never went to pre-school. He will never go off to High School, or college or get married. He is forever 21 months. When Alexander was born I imagined a life for him – a future, things we would do as a family. Those hopes and dreams are gone now. With the girls, I try not to think to far ahead – part of the PTSD I suppose. But instead, I am just enjoying every day and every change with them. When they were babies, I again thought they were kind of boring. Although, after we had Elizabeth, I did enjoy those quiet moments of rocking her to sleep, after a day of running around with Julia. And there are times, I wish that I could just rock them to sleep and not have them be wiggle monsters. But mostly, I am just trying to live in the moment, and enjoy whatever moment that is. Right now I am enjoying watching Julia’s imagination grow! It is fun to see the world through her eyes. Last week we were baking cupcakes. While we were waiting for them to bake, she went to her play kitchen to bake some more “cupcakes”. Because it was late, and we wanted to frost the real ones, I put them in the fridge to cool off. Shen then did the same with her pretend cupcakes. I took her to a little museum this week, that had a play kitchen. She spent such a long time in that one space!! Elizabeth is growing up too. She enjoys her blocks and bucks and putting hats on her head. It is fun to watch her too. Perhaps one day when they are older, I will long for these days of them being silly and playing make-believe. But for now, I am loving the age they are, and looking forward to how they will grow up and change. Every age is special. Enjoy the moment. We once again had Oreo Cookie Day on June 25th. If you missed it this year, don’t worry! ANY day is a good day to eat Oreo’s and to celebrate LIFE!!! Today was overall a good day. Julia had a little camp to go to in the morning. We went and got Alexander a birthday balloon, but did not have a chance to bring it to him as she had her 3 year check up today. All is well with her! Tonight we had a special dinner of Lobsters (because it is summer and why the heck not!?) and I got an Oreo Ice Cream Cake. Julia enjoyed putting the candles on, and wearing a party hat, singing, and blowing out the candles for Alexander. I have seen other friends do similar things, and I had never thought to do it. But this year, now that Julia is getting older and is understanding more, it just seemed to be right to celebrate this way. Julia turned 3 last week. Poor thing was sick on her birthday with a fever. I had a bit of PTSD over this. Alexander had a wonderful 1st birthday, but the next day he woke up with 103 fever. He spent 27 days in the hospital including some time in the PICU. Deep down I knew Julia just had a virus or cold, but that PTSD has a nasty way of sneaking up on you!!! Julia will be going to pre-school in the fall. Another milestone Alexander didn’t get to achieve. But, I am feeling good about it. I have been working with a new therapist on PTSD, and moving FORWARD (not, not moving ON – but FORWARD). Yes, there many be moments that I am sad that Alexander never got to go to school. However, right now I am much more filled with JOY that Julia IS going to school! I already have a backpack for her, and I look forward to going to the store in August to pick out some school supplies for her. We had a little orientation that was held in the Library. I remembered going to the library when I was in school, and getting to order from the Scholastic Book fair. I was excited to think about all the new things she was going to learn at school! Tomorrow it will be 4 years since Alexander joined the angels. 4 years. How did that happen? It seems like a lifetime ago, yet it seems like yesterday. I TRY not to think about what he WOULD be doing if he was alive, but that is hard. I have many friends who have children who are the same age as Alexander, so I have a constant reminder. I have heard some bereaved moms say they just can’t be around children that would be their age. I can understand that. However, for me it is okay most of the time. I don’t have anything profound to say in this post. I miss my beautiful Alexander.